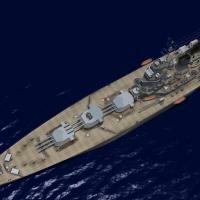 This update of the Nelson class battleship by YEYEYE improves the appearance of the 40mm Bofors & Pom-Pom mounts. It also fixes an issue with previous version of the Nelson that caused the ship to sink from only a hand full of light hits no matter what the "StructuralFactor=" in the Data.INI file was set to. 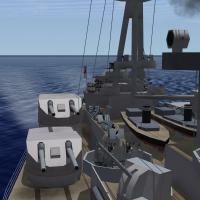 The ship also now has proper Engine Power, EmptyMass, Armor Thickness, Radar Range & Radar Frequencies, and all gun mounts have been given their correct Field of Fire, Rate of Train, Rate of Elevation, and Ammo Capacity. 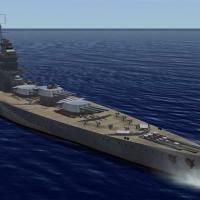 Note: Three "Data.INI" files for the Nelson class have been included. The Alt1 and Alt2LR data.ini variants use alternate guns from the default file. 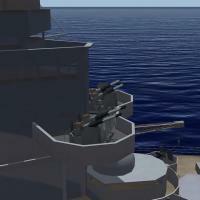 The Alt2LR is the same as Alt1 but has special long range 16 inch and 6 inch guns. 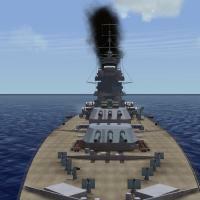 Ship basic model, Multiple-LOD, Damage model, Skin by YEYEYE. New Data INI files and the guns listed below are by KJakker. 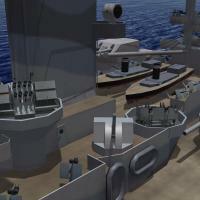 Guns below are from the "ETO/MTO Naval Units Pack". 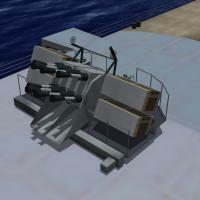 Guns below are from the "Guns Collection for SF2 Series 2.0" by FLOGGER23. Effects are by Stary or based upon Thirdwire. Do not distribute, repackage or post without consent from YEYEYE. No Modifications without previous consent is allowed. And this is freeware, it must not be used in any commercial product. Copyright ? YEYEYE. All rights reserved. Thirdwire and TK for their sim and some instruments.